“The younger authors, being fond of novelty, called Pan ‘Lyceus.’ Others scrapped the name of Pan altogether, and simply called him ‘Lyceus’. 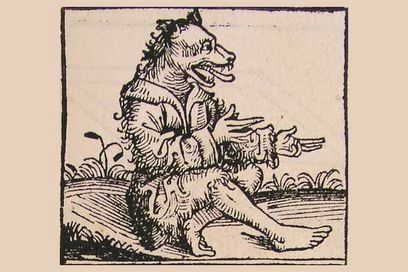 There are a few even who call Jupiter ‘Lyceus’, thinking that it is due either to the intercession of Nature or of Jupiter that wolves were removed from the flocks which rarely saw them. It seemed that he merited the name from the flight of the wolves, since the word lycos in Greek means ‘wolf’. 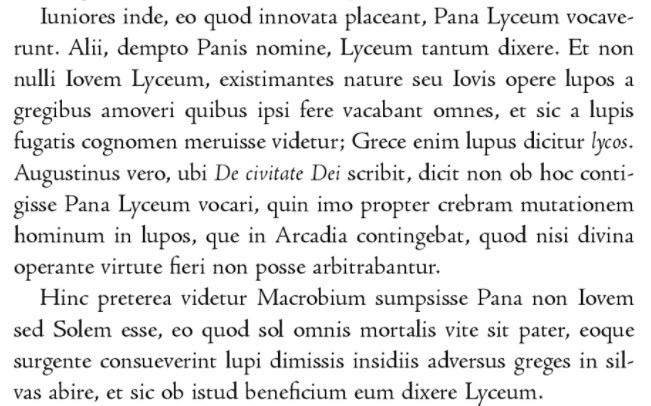 Augustine writes, in his City of God, that it Jupiter was called ‘Lyceus’ for another reason, namely the frequent mutation of humans into wolves, which happened in Arcadia. They used to think that this was impossible without some divine power bringing it about.